Now is the best time in pop culture history, to release an anime about zombies. Zombies have captivated our hearts (and brains), figuratively and literally, for nearly two centuries. The term zombie originated from Haitian folklore. The English word zombie was first recorded in 1819 in Robert Southey’s History of Brazil. Zombie films have been a part of cinematic history since Victor Halperin’s White Zombie in 1932. Most notably our modern conception of zombie comes from George A. Romeros 1968 film Night of the Living Dead. In most recent memory the newest binge worthy, zombie ridden show is The Walking Dead. 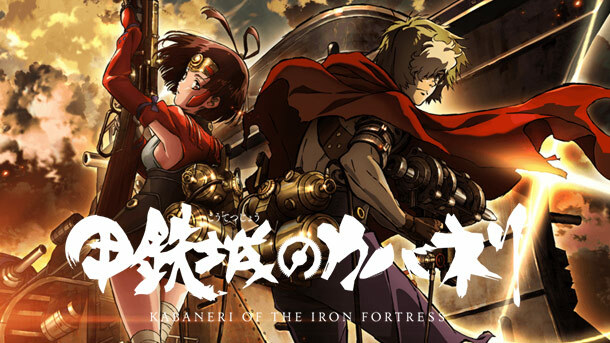 But on the other side of the world, Japan, a new anime called Kabaneri of the Iron Fortress (or also refered to by its Japanese name, Koutetsujou no Kabaneri) has made its mark in the zombie world. Released on April 8, this is a brutal new original anime from the studio that brought us Attack on Titan. Also, the series director of Death Note, Highschool of the Dead, and Attack on Titan. Also, the writer of Code Geass, and the composer from Attack on Titan. This star studded line up caught the attention of many long time anime fans. Hype surrounding this anime was at an all-time high before it debuted. Kabaneri resembles its studio mate, Attack on Titan in many ways. Starting with the animation, for Wit Studio to be such a fairly new animation studio the quality in both of these animes is mind blowing. Every character is outlined in various thicknesses of black which helps separate them from the background and each other. But setting aside the animation, Kabaneri has many similarities in plot to Attack on Titan. Kabaneri, to me, seems like an alternate reality in a Titan fanfiction. Not that that is a bad thing, if anything it is a compliment. I love fanfiction. Instead of giant man eating titans, human sized zombies or in Kabaneri world, kabane, roam the world. Kabane are glowing steampunk zombies whose hearts must be pierced by iron before they die, or whatever happens to reanimated corpses. The people in this world, like in Attack on Titan, do not know why their greatest enemies are the way they are. Granted only two episodes are out by the time I write this, so this may be explained thoroughly as the anime progresses. Instead of the rest of humanity retreating behind 200-foot-high walled cities, humanity retreats into walled stations, all linked together by a massive steampunk train line. Instead of the Scouting Legion fighting these creatures, you have the Bushi guards. The kabane are legitimately terrifying. They glow like molten gold is running through their veins, they swarm their prey in great speeds and they even carry weapons. In the first episode I could not move my eyes away from the screen as a kabane rips part of a woman’s hair from her scalp. I feel like I am actually in this universe fighting for my survival. This anime is everything I did not know I wanted until it landed, glowing and screaming, into my lap. If this anime can maintain the fast-paced energy of the first episode, and the world building and horror of the second episode, Kabaneri will easily be one of the best animes of this year. I give Kabaneri of the Iron Fortress, five Riverhawks out of five Riverhawks.